Adam Gilchrist has become the most wanted player for the inaugural Indian Premier League with none other than Bollywood Superstar Shah Rukh Khan lining up for the signature of the retiring Australian great for his Kolkata team, according to a newspaper report. Khan, who bought the Kolkata franchisee for USD 85 million last month, has told former India captain Sourav Ganguly, who will skipper the team, to sign Gilchrist for the Twenty20 competition, which begins on April 18, Herald Sun reported. 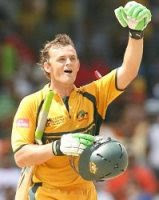 Gilchrist is one of the 11 Australians, who have signed an expression of interest for playing in the IPL. With the sponsorship conflict between CA and IPL organisers lingering on and Australia having commitments in Pakistan in March-April, Gilchrist could be the only Aussie player available for the cash-rich tournament. Technically, there is also a two-year moratorium on retired players joining a franchisee team but it is understood that Gilchrist's playing in the IPL has become a mere formality after IPL organisers have hinted that they would waive the "cooling off" period in his case. The report also claimed that Gilchrist can expect a base payment of USD 300,000, which could double or triple when the franchises bid for players, and he would be earning more in 44 days in the IPL than a full year of international action.